I was lucky enough to be called on a Nashville shoot recently. All I had was an address, didn’t know who or where. It turned out that we were shooting at Cash Cabin studios… as in JOHNNY Cash… shooting IBMA and Grammy winner Shawn Camp with country music legend Loretta Lynn. We recorded not just interviews, but several duets with Loretta and Shawn, and I had the best seat in the house. At 82 years old, her voice is still as strong as ever. Cash Cabin studio is just rotten with country music history as well. It was originally built in the seventies as a getaway for Johnny Cash. As his health began to decline in the nineties it was converted into a studio to avoid trips into Nashville studios. There are artifacts galore all over the place… like a letter to his 10-year-old son John Carter Cash showing the chords for I Walk The Line, photos, classic amps, mics… about the only thing missing was a nice big old analog console. Like most folks, they do everything on ProTools now, as it’s still a working studio. While it’s generally frowned upon, I couldn’t resist a few quick photos. Enjoy! 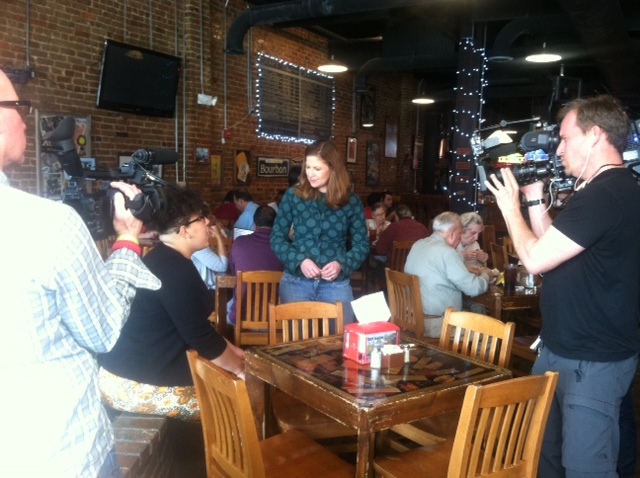 I just completed work on a story for NBC Nightly News about an organization called BamaCovered. Daniel Liss is a 25-year old recent graduate of Harvard who was, until recently, working in London as an investment banker. He and a friend Josh Carpenter were dismayed by the state of health care in Alabama and the amount of difficulty (and downright false information) people were receiving navigating the health exchanges to get insurance. So they started a foundation called BamaCovered. This is a group of volunteers, mostly college students, who are canvassing the community, trying to help people get health care coverage. One of their success stories… a woman on a fixed income of $800 a month was told that insurance through the exchange would cost her $700 per month. With the help of Josh’s volunteers, she received a quote of $25 per month. NBC Nightly News Producer Doug Adams and White House correspondent Peter Alexander flew into Huntsville, AL where DP Roger Herr (In Sight Out Productions) and I met up with them. We shot at several locations around Huntsville- a free health clinic downtown, Peter’s Barbershop, Big Spring Park downtown, and Huntsville radio station WEUP, Alabama’s first black-owned radio station. 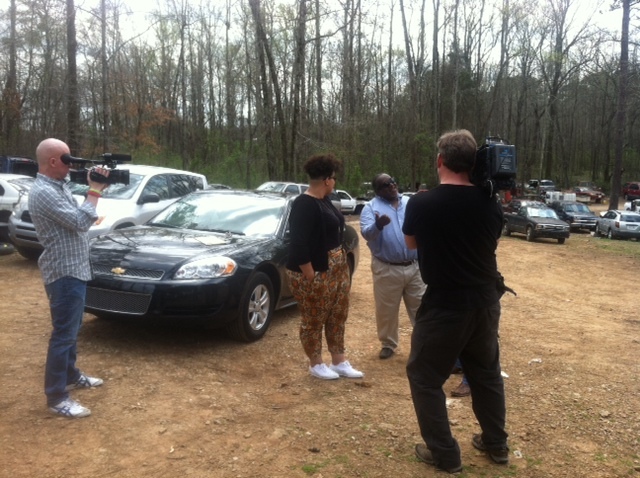 It’s a great story that should air sometime late next week… don’t miss it! 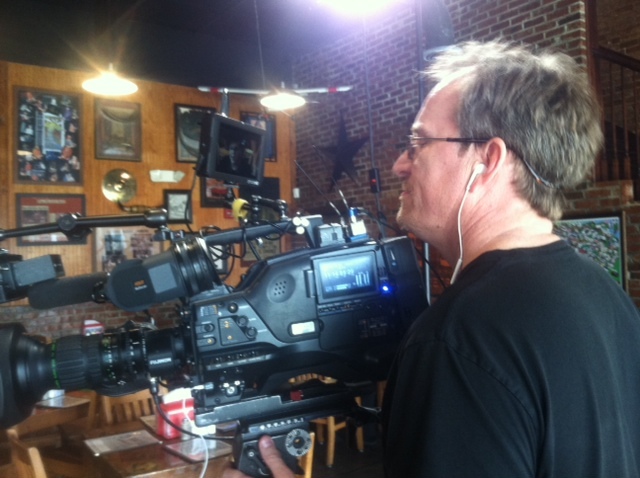 Roger Herr on camera, Brian Gilbert location sound, Peter Alexander and Josh Liss. 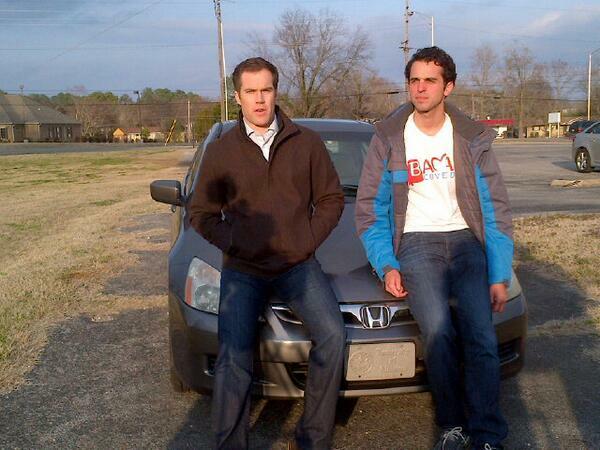 In the WEUP parking lot in Huntsville, AL. Photos by Doug Adams. Just in case anyone was wondering, I thought I’d outline my typical 664 workflow as it relates to media management. The Sound Devices 664 is kinda particular about the media cards that it likes, and while SD and CF cards are quite common, there are only a handful that work in the 664. For this reason, I never release my cards at the end of a shoot… I wait while the DIT copies them to a hard drive. If there’s no DIT working on the set, I’ll copy the files myself to whatever is available. It’s fairly rare for a photographer or producer to show up without a computer, but I always try to bring mine along, just in case. When I first bought my 664, I went out and bought three of each… three 16GB Delkin CF700x UDMA6 CompactFlash, 105MB/s read, 67MB/s write, and three 16GB Delkin SD163x Class 10 Secure Digital, 24MB/s read, 17MB/s write. I also picked up an inexpensive card reader and a case for the cards. One thing you DON’T want to do is use cards that are not on the list of approved media for use by Sound Devices. Go to their website, the list is updated every so often. These are the cards that I use in my 664. They work fine and are approved by Sound Devices. Transcription recordings are always the fly in the ointment. These are often requested as MP3 recordings with linear timecode on one channel, and audio on the other. It’s possible to do this internally with the 664, but you’ll need a special cable and an open channel. If you patch the timecode out to, say, ch6 input, then you can assign that signal to whatever card will record the MP3. Because, I’m such an old fart, I’ve always been a bit nervous about doing it this way. Back in the day, we had lots of trouble with linear timecode signals bleeding onto other tracks, as it’s generally very hot. If this happens to the main audio tracks, then you’re screwed. Alternatively, you can use an entirely separate recorder, and that’s how I did it on a recent shoot. I used my Sony PCM-10, and built a special cable for it. The cable has a 3.5mm stereo plug on one end, and the other has a fanout with a single 3.5mm plug and a BNC connector. The BNC gets the timecode and the 3.5mm goes to the 664 tape out. If the cable is built normally, then the timecode signal will be really hot while the audio signal will be really low. I added a teeny resistor inside the connector shell to drop the level of the timecode signal, and get the levels on each channel to match a little more closely. It worked like a charm. Here are a few photos from a shoot that I worked on a few months ago. Grills Gone Wilder is airing now on The Travel Channel. This shoot was fun because of the subject matter… barbecue… and the fringe benefits. 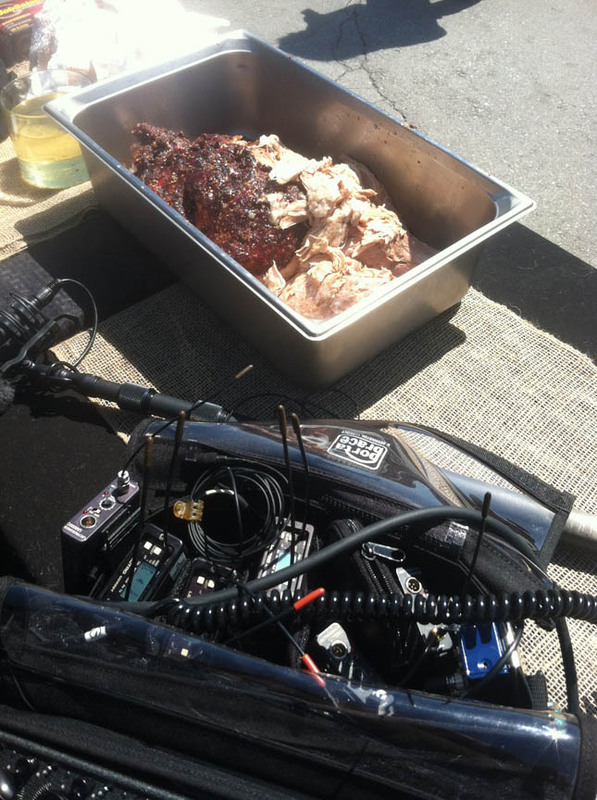 Since everyone else on the crew was flying, they couldn’t accept the “on-camera-Q” that was offered, so I ended up with about five pounds of whole-hog pork from Martin’s Barebecue Joint in Nolansville, TN. 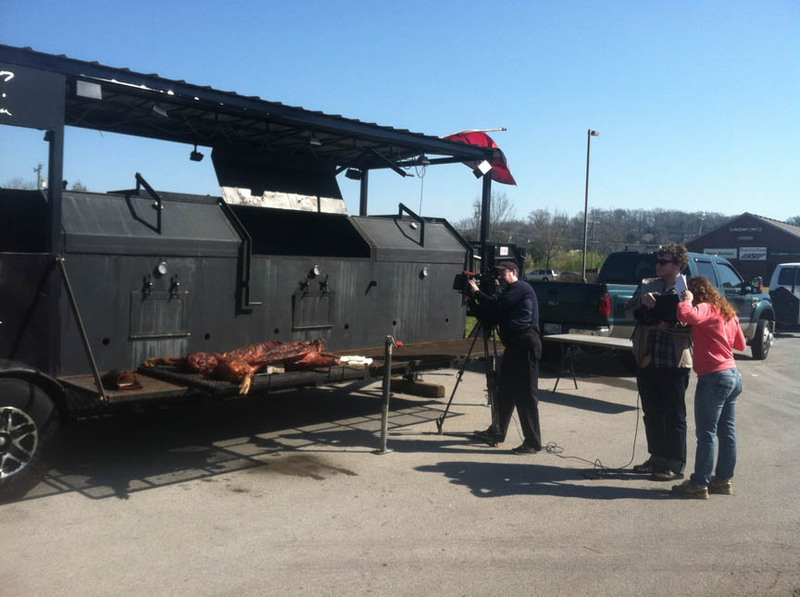 Shooting around the Martin’s massive smoker, which can handle multiple whole hogs. I’m a bit of a barbecue junkie… I love to try out different Q stands when I travel, so I’ve sampled quite a lot. My top two places are Stanley’s in Tyler, Texas (we hit that one pretty hard when we were shooting on The United Bates of America) and Martin’s. This shoot wass one of the first I did with my new Sound Devices 664 mixer/recorder, and I can say without reservation that I LOVE this unit. It’s a little intimidating at first, as it has ten times the functions and options of my old 442. But the folks at Sound Devices seem to appreciate the pressures of bag work, and they’ve made all the menus and functions very quick to get to & change. There’s an option to connect a USB keyboard, but I’ve entered the metadata using the rotary encoder & it works fine. I’m running the risk of getting pig fat on my nice new mixer here, but it was so tasty I had to risk it. That’s not to say that there aren’t a few small details that I’d like to see changed. It really should ship with an external power supply, since the battery tube just doesn’t really work. I understand that a tube of AAs lasts about a half hour. I’ve never tried it, since that much time isn’t really worth the weight of the batteries, so the tube stays empty. Instead I use a Remote Audio BDS with an NP1 battery cup to power the whole bag. I get around two hours use out of a NP1, depending on the age of the battery. 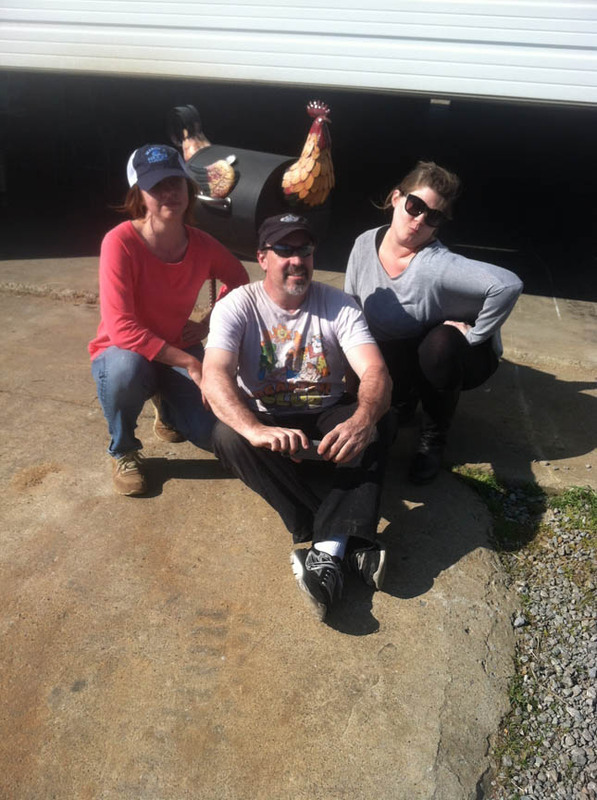 The Grills Gone Wilder crew, April, Ilsa, and Joe. Another change I’d like to see in the 664 Mark 2 is the way that data is transferred. Right now, you need to eject the cards and insert them into a reader in oder to transfer your data at the end of the day. The CF card is very difficult to remove, as I can’t get my fingers around the edges. And fragile… I’ve already experienced a bent pin on my card reader. 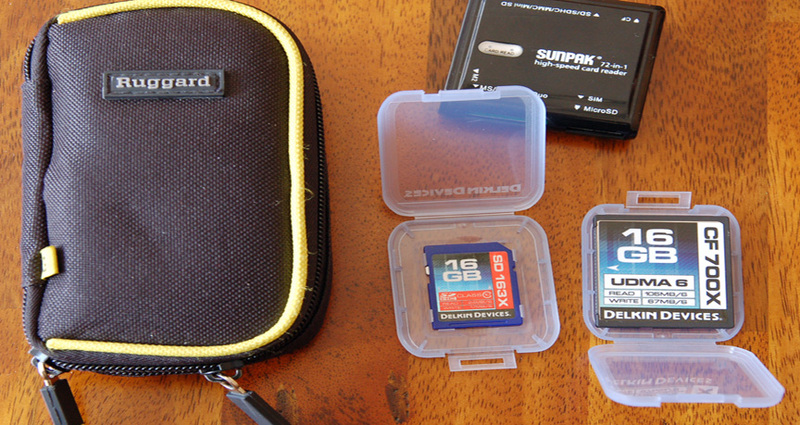 The SD card is easier, so I write data to both cards but use the SD for transfers. The better solution is to have the data available at the USB port so the cards could stay in place.